Here’s the recipe for Kadhai Vegetable, from Sanjeev Kapoor’s “Simply Vegetarian”. 1.String and wash French beans. Peel and wash carrots. Wash, halve, and deseed capsicums. Cut all the vegetables into ¼ th inch cubes. Separate cauliflower into small florets and wash. Wash tomatoes and chop roughly. Peel, wash, and slice onions. Wash and drain green peas. Remove stems and break red chillies into two. 2.Grind coarsely three of the red chillies with coriander and cumin seeds. Peel and wash ginger and garlic. Remove stems and wash green chillies. Clean, wash, and chop coriander leaves. 3.Grind half of the ginger with garlic and green chillies. Make julienne of the rest of the ginger. 4.Heat oil in a pan. Add the coarsely ground masala (coriander seeds, cumin seeds, and red chillies). Add sliced onions and sauté till golden brown. 5.Add ginger-garlic-green chilli paste and sauté for one minute. Add the vegetables except capsicums and tomatoes and stir. Cook covered on low heat till carrots are almost done. Sprinkle a little water if necessary. 6.Add turmeric powder, coriander powder, and red chilli powder. Stir continuously. Add tomatoes, salt, and half cup of water. Cook till the vegetables are cooked and water dries up. 7.Add capsicums and cook for 4-5 minutes on low heat. Sprinkle garam masala powder. 8.Serve hot garnished with ginger julienne and coriander leaves. this curry with lots of veggies will be a healthy dish!!!! nice presentation too! 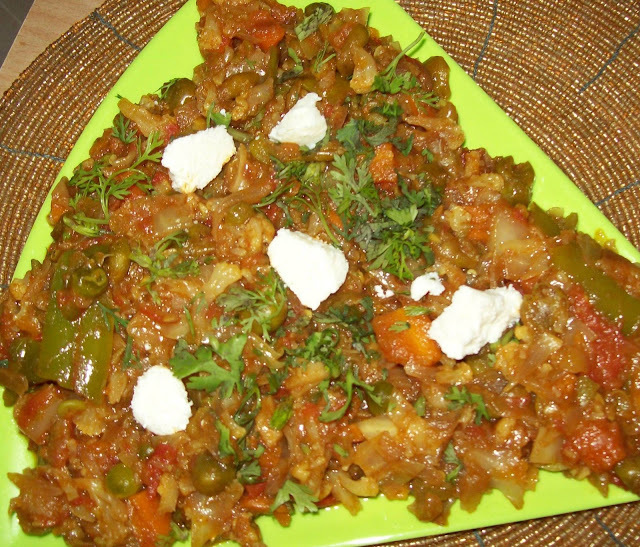 Kadhai Vegetables looks really mouth watering and irresistible..